Cell Therapeutics Inc (CTI) has met its objective of finding a commercial partner for cancer candidate pacritinib by the end of the year, licensing rights to the drug to Baxter for $60m upfront plus milestones. Pacritinib is an oral JAK2/FLT3 inhibitor, targeting two mutations implicated in a spectrum of blood and solid tumours, and is currently in phase III testing as a treatment for the blood disorder myelofibrosis. The deal gives Baxter profit-sharing rights to pacritinib in the US and exclusive commercialisation rights elsewhere, with CTI earning royalties on ex-US sales and up to $112m in milestone payments, around $40m of which could be forthcoming in 2014. Pacritinib works in a similar fashion to Novartis' recently-approved treatment for myelofibrosis Jakavi (ruxolitinib) - tipped to become a $1bn drug - as well as other pipeline candidates such as Gilead Sciences' CYT387, although CTI believes its drug may offer some advantages. Specifically, the company's chief executive James Bianco maintains that pacritinib is less prone to causing reductions in blood platelet counts, which can limit treatment. "Other JAK2 inhibitors have been associated with treatment-related anaemia and thrombocytopenia, and this was not observed in patients on pacritinib," he said last month. Pacritinib "could effectively address an unmet medical need, particularly for patients living with myelofibrosis who either face treatment-emergent thrombocytopenia on marketed JAK1 and JAK2 inhibitors," he noted. The drug could also have a key role to play in patients who have disease-related thrombocytopenia that is not being managed effectively on low doses of a currently approved drug, he added, noting that additional data on pacritinib will be presented at the American Society of Haematology (ASH) conference in December. CTI is on track to initiate a second phase III trial of pacritinib before year-end and expects to complete patient enrolment in the first pivotal trial in early 2014. It is also expecting to start trials of pacritinib in acute myeloid leukaemia patients with FLT mutations - in collaboration with the UK Medical Research Council - in the coming weeks. Meanwhile, for Baxter the agreement provides another late-stage cancer therapy as it continues a strategy of boosting its oncology pipeline and diversifying further beyond its traditional focus in blood and plasma products. 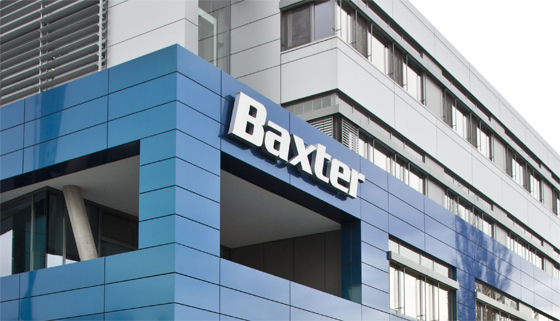 "The collaboration will complement Baxter's existing oncology business and growing oncology pipeline," commented Ludwig Hantson, president of Baxter BioScience. Just over a year ago Baxter signed a $565m deal with Onconova to secure rights to rigosertib, a dual PI3K and PLK -targeting drug in late-stage development for myelodysplastic syndromes and prostate cancer.